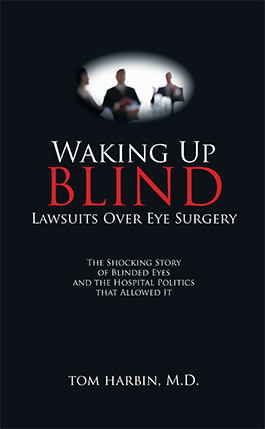 Waking Up Blind is the gripping story of how an eye surgeon became the cause of an array of medical problems for his patients. It is also the story of how one of the nation’s premier medical centers tried to conceal the growing scandal. The faculty members who exposed the problems were punished. Official committees and the university leaders minimized the misconduct. Slowly, lawsuits and publicity brought these shameless acts to light. With the use of court documents, transcripts of tape-recorded conversations, interviews, and personal observation, Dr. Tom Harbin presents this case from the very beginning, uncovering all levels of wrongdoing and secrecy. Waking Up Blind will shock you with its candid exploration of the dark side of medicine. I wrote Waking Up Blind because I was involved in some of the events and witnessed the destruction of the academic careers of two courageous faculty members who spoke up to try to prevent damage to patients. As time passed, the story stayed in my mind and eventually demanded to be told. I wanted to set the record straight and redeem the reputation of two good doctors. "A compelling story of medical tragedy." At age 74, Sargus Houston lived a simple life with one good eye and one bad eye. His doctor in Macon, Ga. referred him to a doctor in Atlanta, one of the best in the state, the chairman of the eye department at the major academic medical center. That Atlanta doctor recommended surgery on his bad eye and Sargus accepted his recommendation. The doctor operated on the wrong eye, Sargus Houston’s good eye, and then tried to cover up the reasons for his mistake. He later operated on the bad eye, but neither eye saw well after surgery. In fact, less than two years after the first operation, Sargus was totally blind. Why? He had developed glaucoma, a rather easily detectable problem, and his Atlanta doctor had not treated him. In an investigation by his own faculty, a committee found that this doctor had neglected to treat glaucoma in many of his patients. Gladys Wilson lived in Decatur, the location of Emory University, the major academic medical center in Georgia. She knew she had cataracts and referred herself to the chairman of the eye department at Emory. He told her that she also had a corneal disease and recommended she have a corneal transplant and cataract removal. She accepted. During the surgery, the doctor had problems and afterwards, the eye developed complications and needed two more operations for retinal problems. This eye went blind. When the pathologist looked at the corneal tissue, he could find no sign of the disease the doctor had diagnosed. A later faculty investigation determined that the chairman had operated on many eyes with no disease. Gladys Wilson lost her eye from unnecessary surgery and later went blind in her other eye. Mattie Sue Brown lived in Calhoun, GA, about sixty miles from Atlanta and Decatur, the home of Emory University. When her vision became blurry and she was told of cataracts, she selected the chairman of Emory’s eye department as her doctor. He told her she also had a corneal disease and told her she needed a corneal transplant as well as a cataract removal. After her surgery, she never saw well because of an irregular cornea, and being one-eyed changed her life for many years. She constantly worried about her eye and stopped most of her activities. She was very unhappy, especially when she found out that she did not have the corneal disease that was diagnosed and did not need the corneal transplant surgery that bothered her for so many years. “Genevieve, block that eye.” The surgeon, gowned and gloved, pointed to the patient’s left eye. Genevieve Switz hesitated, and as she later recalled, looked around for the operative permit. As the physician’s assistant, she always checked the op permit one last time before an operation began. She had barely stepped into the room; everything was rush-rush. It was 6:00 PM, and this was the thirteenth operation of another long, hard day. “Come on. Let’s go.” Genevieve heard the stress in his voice. She proceeded to block the eye without looking at the permit. The patient lay sedated and oblivious while Genevieve pierced his left lower lid with the 26-gauge needle—a needle quite sharp, thin, and long—and maneuvered the tip to a position behind the eye. Five cubic centimeters of Xylocaine filled the space, paralyzing the muscles that move the eye and numbing the pain nerves. The surgeon, H. Dwight Cavanagh—M.D., PhD, professor of ophthalmology and department chairman at Emory University School of Medicine in Atlanta—prepared to perform a corneal transplant with removal of cataract and insertion of lens implant. First he sewed a ring to the sclera, the “white” of the eye, to prevent collapse later in the operation when the eye was open and vulnerable. Cavanagh had almost finished attaching the ring when Dr. Philip Newman, the senior cornea fellow who was Cavanagh’s first assistant, entered. Newman would remember Cavanagh’s icy look and reprimand for the patient’s poorly dilated pupil. In cataract surgery, the pupil should be dilated before the patient enters the room. Newman mumbled an apology and busied himself with the donor cornea. Newman turned the tissue upside down and picked up a circular cutting tool to punch out a dime-sized button from the center of the cornea. Meanwhile, Cavanagh twirled a slightly smaller instrument through the center of the patient’s own cornea until only a tiny barrier kept the circular blade from penetrating the eye. Using scissors to cut into the eye, he removed the smaller button, leaving the eye open and exposed. This is a critical moment. If the patient coughs or moves, the contents of the eye could spill out, leaving the eye forever blind. Speed counted now, while the cataract was removed and replaced. Still grumbling about the insufficiently dilated pupil, Cavanagh demonstrated what must be done to the cataract when pupils are not dilated. Pushing the iris aside to gain room, the surgeon removed the cloudy lens and placed a plastic lens exactly where the old one had resided for seventy-four years. Coaxing the button of clear donor cornea into the slightly smaller ring of remaining host cornea, he swiftly placed a silk suture at 3:00, 6:00, 9:00, and 12:00. With the graft in place, the eye had a barrier—a clearer barrier—to the outside world. Everyone began breathing again. Another success, and with an operation not easily performed. Dr. Cavanagh turned to Dr. Newman and instructed him to finish the case and left to dictate the operative reports. Newman must have appreciated Cavanagh’s dictating his own notes, especially since Cavanagh required two reports for each operation, where other surgeons only required one. Most surgeons assigned this tedious work to assistants, so Dr. Newman was lucky. It took Newman thirty minutes and twenty-four bites of the needle to run a suture smaller than a human hair, a suture that provided continuous closure to supplement the four silk sutures placed by Dr. Cavanagh. Then Newman sewed the patient’s eyelids partially shut to protect the surface of the new graft. Meanwhile, Cavanagh dictated two separate notes about the operation. He first described the intraocular portion of the surgery—the removal of the lens and placement of the corneal transplant. The second note detailed the extraocular portion of the surgery, the part where the lids were sewed partially shut. During the thirty minutes it took Newman to complete the surgery, Cavanagh also dictated the notes for his other twelve cases. All the cases had gone well. He was one of the busiest corneal surgeons in the nation and justly proud of it. The next day, the patient woke up blind.